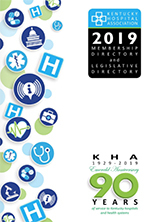 KHA continues to work tirelessly on behalf of all Kentucky hospitals to resolve ongoing issues with the state's Medicaid managed care organizations (MCOs). Use the information below to stay informed on the Association's advocacy activities. KHA hosts meetings monthly for hospitals and MCO representatives to help resolve ongoing issues. Recordings of past meetings are below.